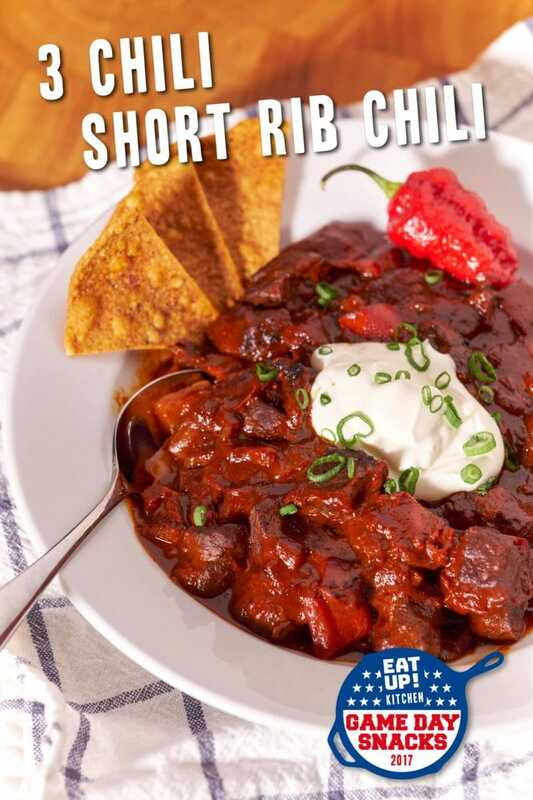 I don’t know if you guys are ready for this Three Chili Short Rib Chili – this is next level stuff. 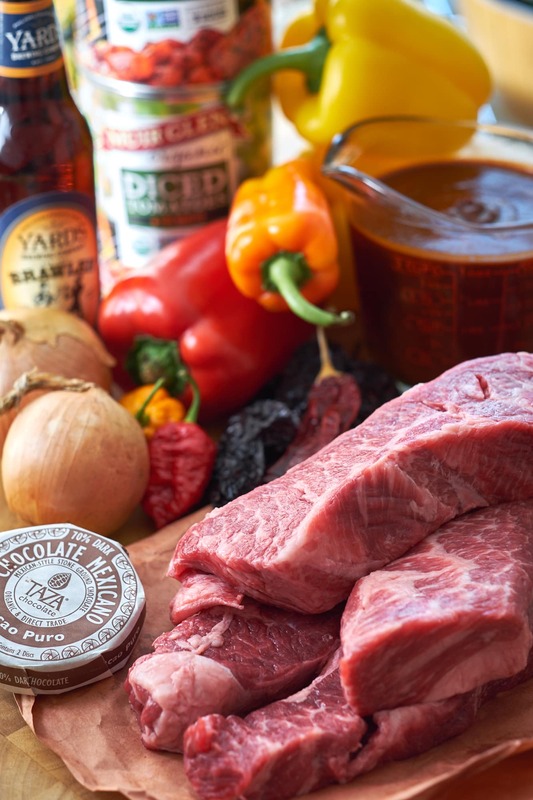 We’re making our own chili sauce and we’re adding dark beer and chocolate to this Short Rib Chili! 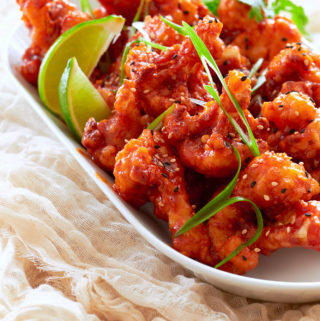 It’s rich, smokey, sweet, and just a little spicy. 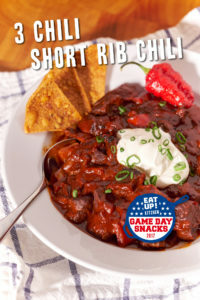 I thought you might want to make this for Game Day to share with your friends so I’m adding this to my (sadly neglected) Eat Up! Kitchen – 2017 Game Day Snacks! We’re going to tackle this in… heh, ‘tackle’, this in four steps. 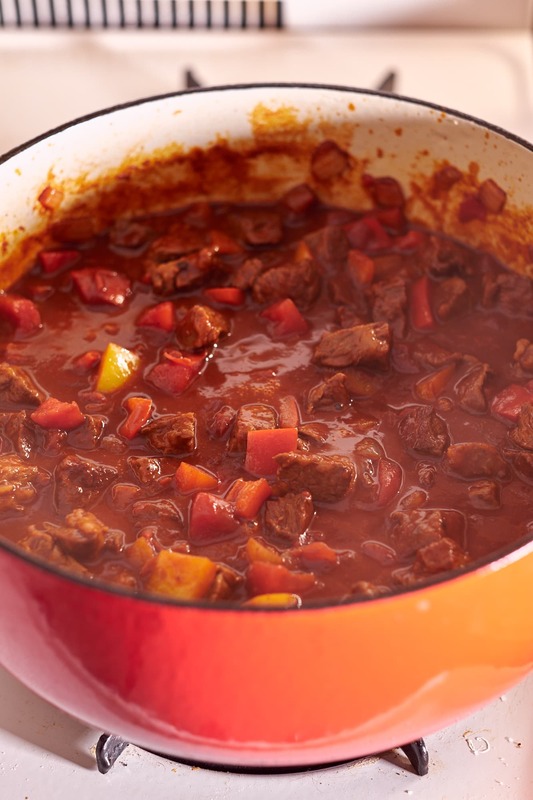 Rehydrate the chilis, blend the homemade chili sauce, butcher and brown the boneless short ribs, and stew the chili. 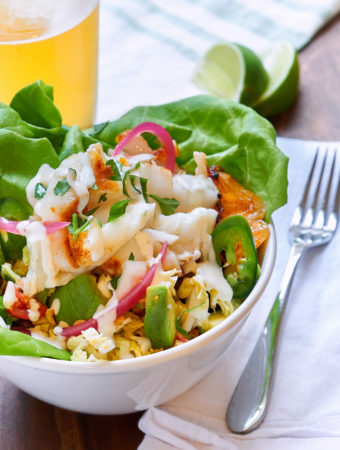 There’s nothing difficult about this recipe aside from acquiring some dried chilis. 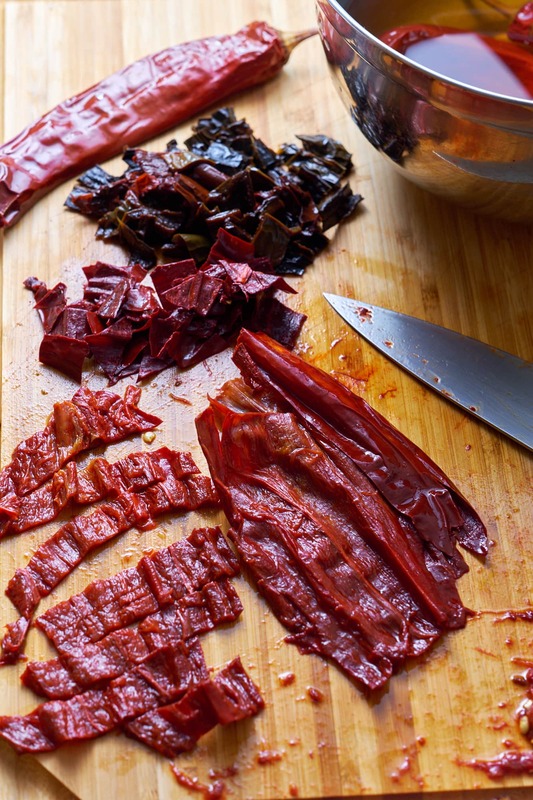 Rehydrate your dried chilis, shown on top, in hot water for at least 2 hours. Rehydrated on bottom. Reserve the liquid for the chili sauce. The first thing we’re going to do is rehydrate our chilis. We’ll need three bowls to hold the chilis as they rehydrate in steeping hot water for at least 2 hours (I did mine overnight). Add just enough water to cover the chilis then place something on top of them so they don’t float to the top. After a couple hours, the chilis should be limp and filled with water. Remove them from the water, remove the stems and seeds and chop them up. They’re going in the blender so you don’t have to get too crazy here. Remove stems and seeds and chop chilis. Now that our chilis are chopped, let’s prep the rest of the chili sauce ingredients. We’ll need 1/4 cup of each of the leftover liquids from the chilis (3/4 cups total), 1/4 cup Light Brown Sugar, 1/4 cup Apple Cider Vinegar, and 1/2 cup Water. Put it all in the blender and blend for a couple minutes on medium. 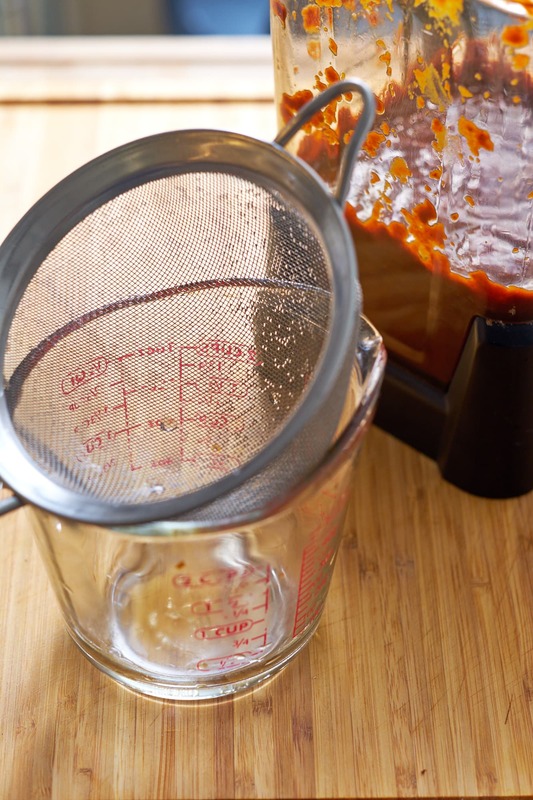 Strain this sauce with a fine mesh strainer in to a container. you should have about 2 cups. Go ahead and taste it. It should be smokey, sweet, thick, and a bit spicy. If you want more heat, feel free to improvise. If you’re going to use fresh chilis like habanero or jalapeño, you can add them to the blender. 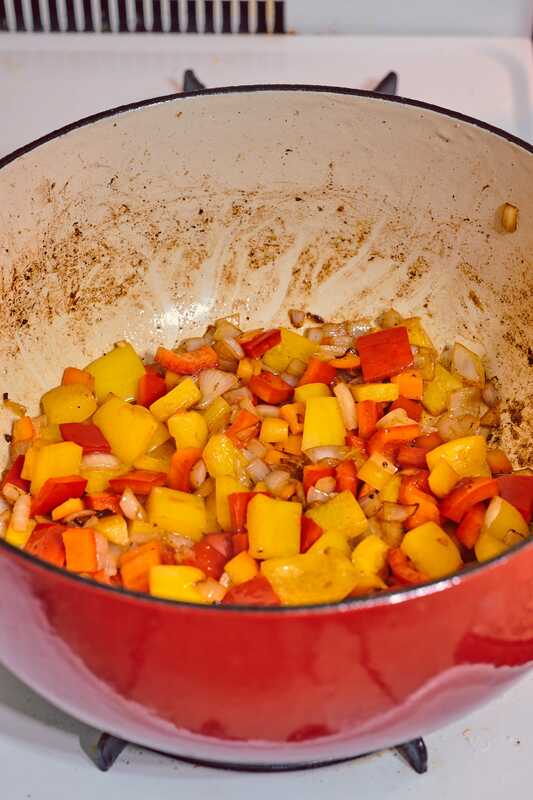 If you’re going to use a cayenne or ancho powder you can add that to the pot to cook. 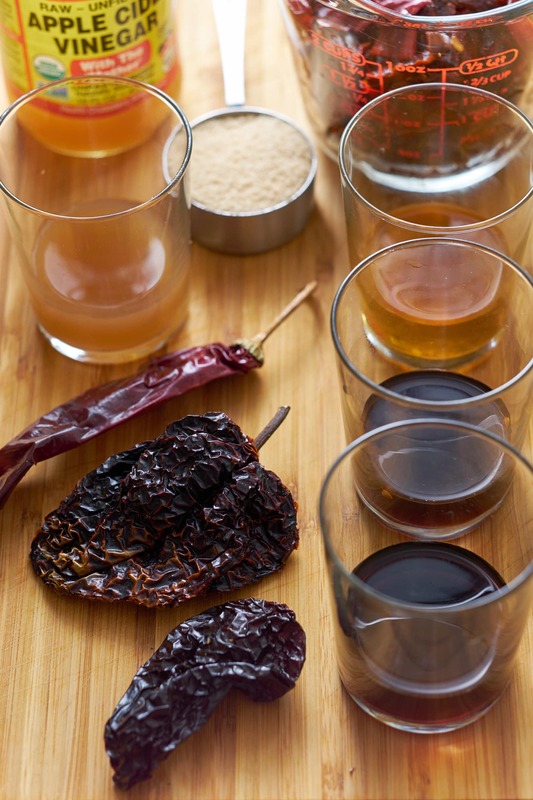 3 Red Ancho Chilis, 4 Guajillo Chilis, 4 Chipolte Chilis, 1/4 cup Apple Cider Vinegar, 1/4 cup Light Brown Sugar, 1/4 cup Each Chili Liquid, 1/2 cup Water. 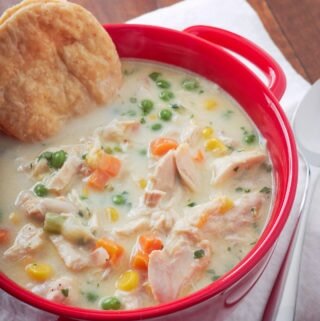 Blend all ingredients then strain to remove any chunks. For the boneless short ribs, you’re going to dice three pounds in to 1/2 inch chunks. 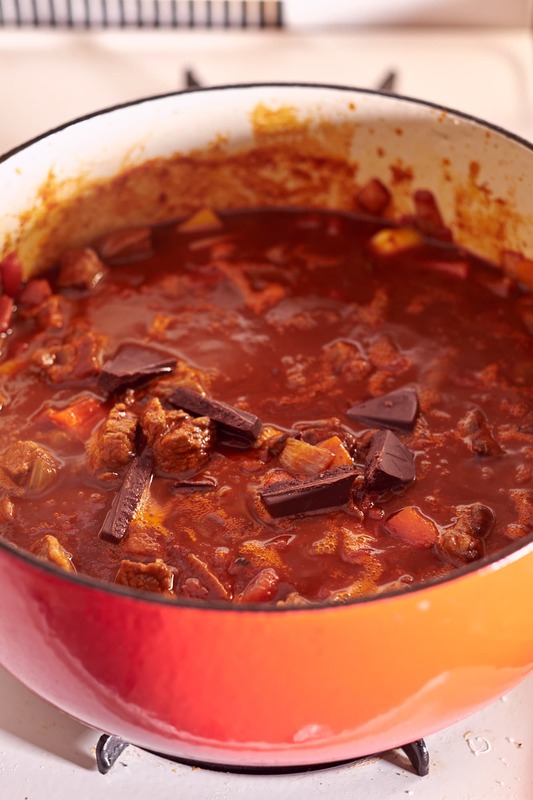 Remove and discard of any larger pieces of fat – that’s just going to make your chili gross. 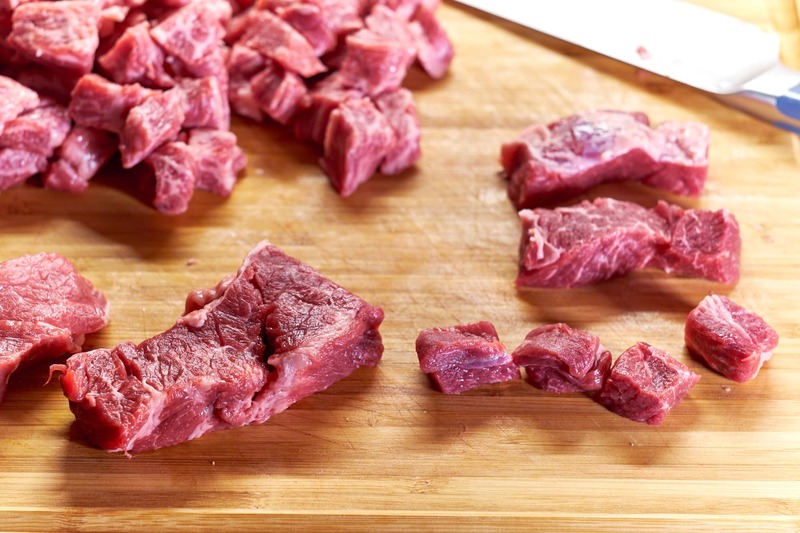 Divide each piece of meat in to thirds then carefully slice them in half horizontally. Cut them in to half inch slices and then in to cubes. Try to make everything the same size. You want the meat to cook evenly and to easily fit on your spoon / fork. While we’re in chopping mode, let’s chop some veggies. Dice a medium onion and three bell peppers that aren’t green. Green peppers are bitter and taste like leaves. Dice the peppers and onions about the same size or bigger than the meat. 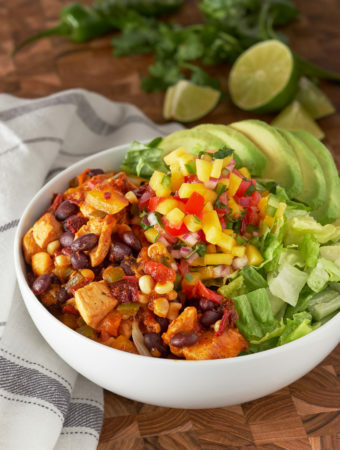 We want to make sure they don’t completely break down and have some texture to offer the chili. 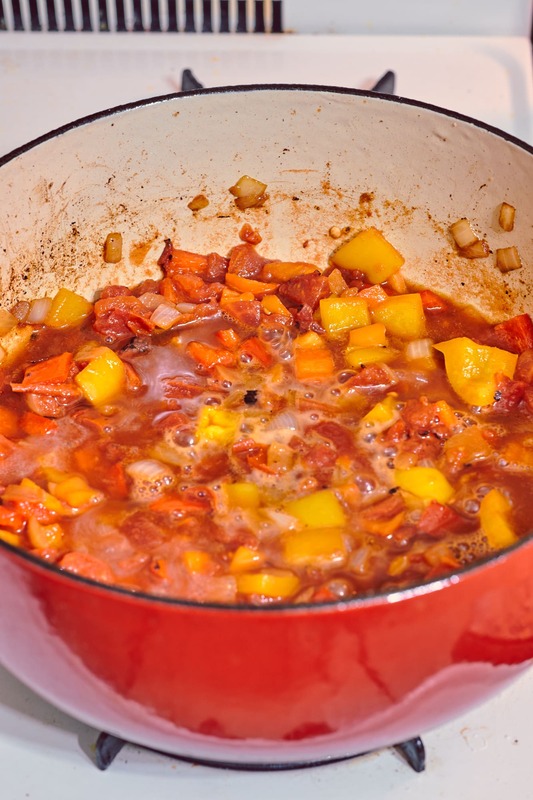 Add a tablespoon of vegetable oil to a dutch oven on medium-high heat and add a quarter of the meat. Make sure each piece is in contact with the bottom of the pot and has some breathing room. Dust with one teaspoon of kosher salt. Let the meat sit and sizzle untouched for 2 minutes. Give it a stir to make sure its well browned and then transfer to a plate. Repeat with the remaining three quarters of the meat. Reduce the heat to medium and sauté the onions for one minute in the same pot you just removed the browned short ribs from. After one minute add the peppers. If you forgot to add some fresh hot peppers to the blended sauce or you’ve changed your mind, now’s a good time for them. Brown the Short Rib for 3 minutes in batches. Remove from the pot then saute onions and bell peppers until tender. 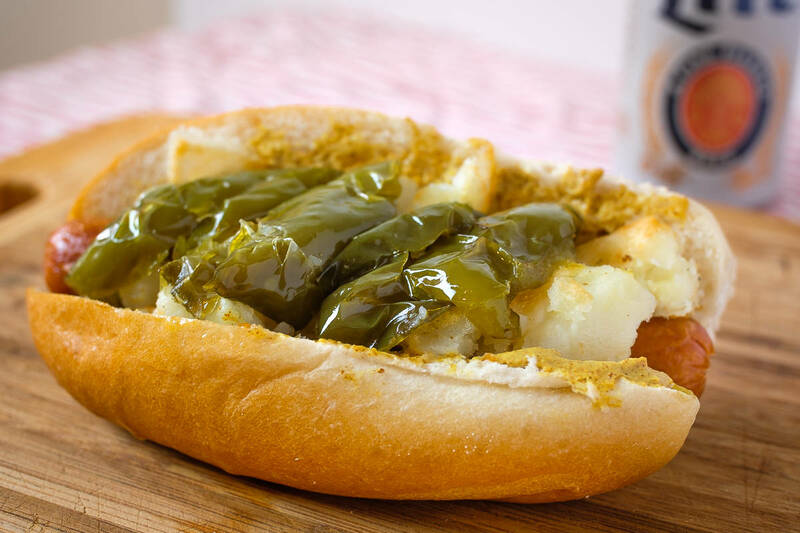 Once the peppers and onions are tender we can start adding the remaining ingredients. You could probably add them all at the same time but I like to add one at a time and let it come up to temperature. This way the whole pot of chili isn’t entirely shocked by the dramatic drop in temperature. Stir in the fire roasted tomatoes and let them come up to temp for a couple minutes. Then add your dark beer. The beer should be a room temp porter or dark lager. I’m using Philadelphia’s Yards Brewing Company Brawler which is a Pugilist Style Ale (which is neither a porter nor a dark lager). Allow the chili to come back up to temp then add the browned short ribs. Simmer this with the lid on over low heat for about 30-40 minutes. 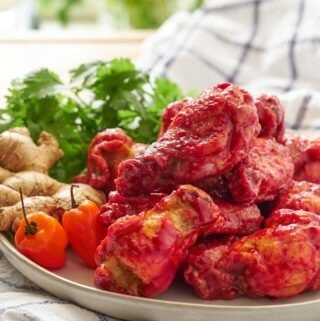 We’re looking for the meat to be tender but not to the point that it’s falling apart. Add Chili Sauce and browned Short Rib. Simmer on low for 30-40 minutes. We’re nearly done!! 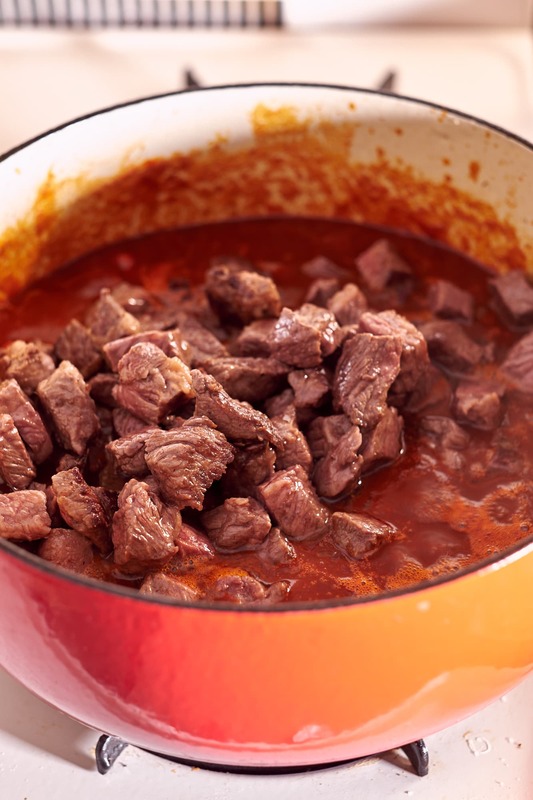 Check on your chili and taste for seasoning – I added a pinch of salt and a little left over chipotle liquid. Now break your dark 70% cocao chocolate in chunks and stir this in to the chili. Let it simmer for another 10 minutes uncovered. Add 70% Cacao and simmer for 10 minutes. Taste for salt and pepper then let the chili reduce over medium heat for 10-15 minutes. 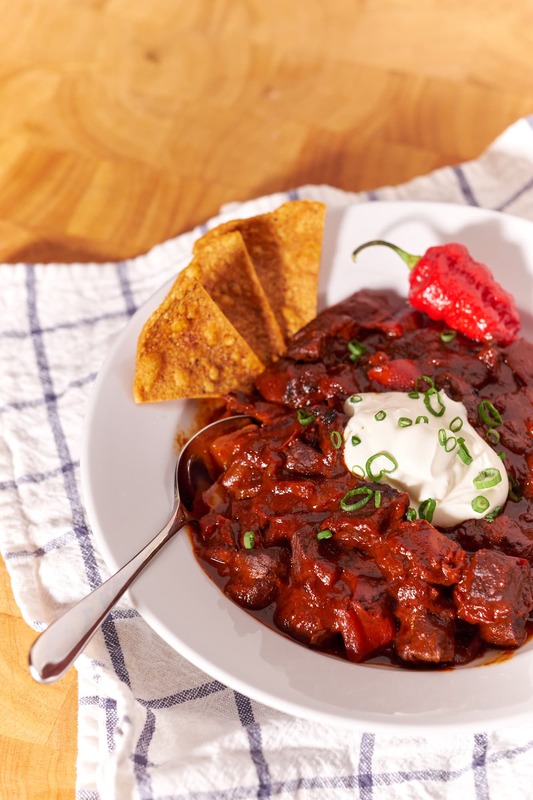 This Three Chili Short Rib Chili is rich, smokey, sweet, and just a little spicy. It starts off with rehydrating three types of chilis for a homemade chili sauce and gets stewed with dark beer and chocolate. 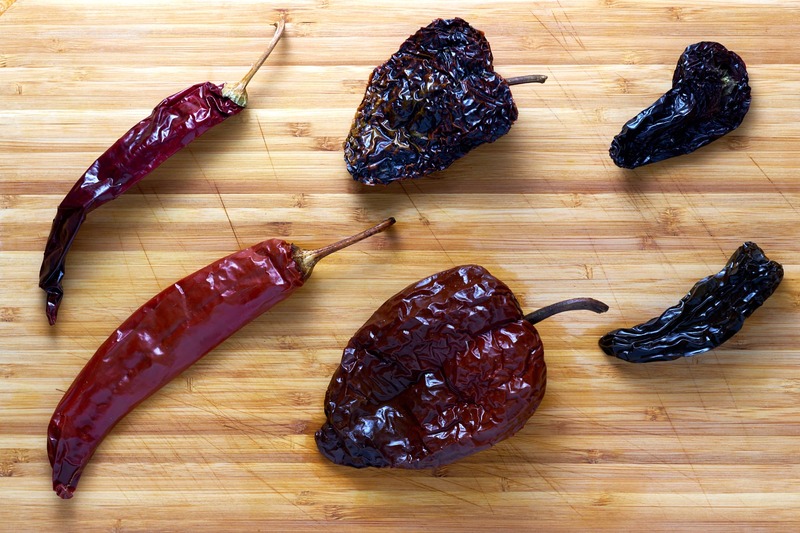 Rehydrate chilis by placing each type in a medium bowl and cover with steeping hot water. Cover to prevent floating and allow to rehydrate for at least 2 hours. Remove stems and seeds and chop chilis. Blend chilis with 1/4 cup of each of reserved chili liquid, 1/4 cup apple cider vinegar, 1/2 cup light brown sugar, and a half cup of water. Divide short ribs in to manageable pieces. Slice in half horizontally and cube in to even 1/2 inch chunks. Chop 3 yellow, red, or orange bell peppers and one medium onion in to larger dices. 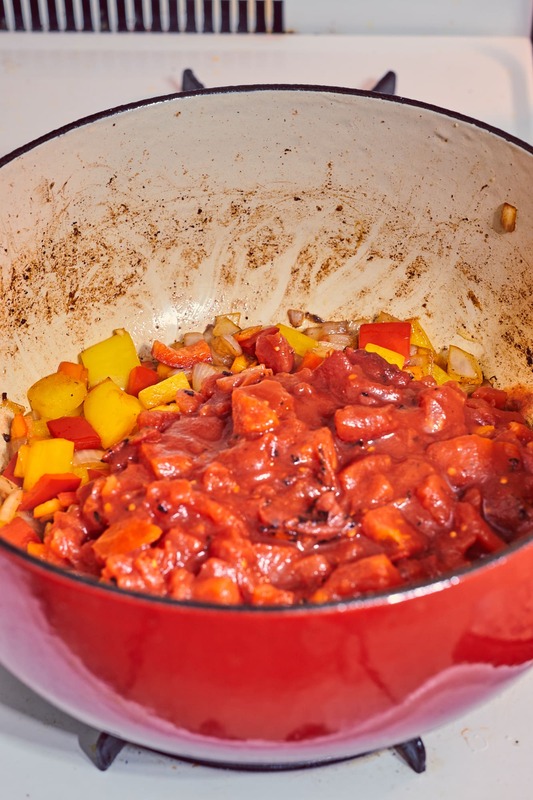 Add 1 tablespoon vegetable oil to a large dutch oven and brown short rib in 3-4 batches. Allow to brown untouched on the first side for 2 minutes. Stir short ribs to remove from dutch oven and set aside. Add Onions to the same pot and sauté for one minute. Add Peppers and cook until tender. 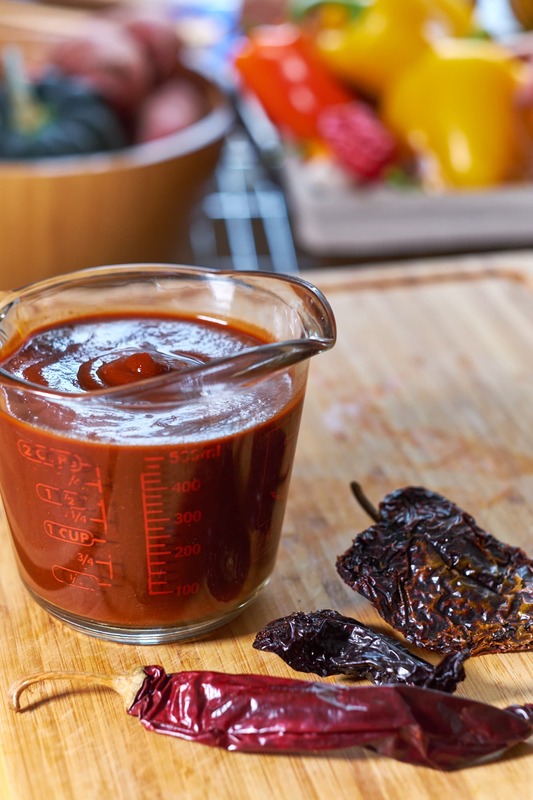 Add each of the following in batches allowing them to come up to temp before adding the next ingredient; fire roasted tomatoes, dark beer, chili sauce. Add the browned short ribs, cover the pot and simmer on low for 30-40 minutes. Check for seasoning; salt, pepper, additional chili liquid, etc.. Stir in chunks of cocoa and allow to simmer for another 10-15 minutes uncovered. 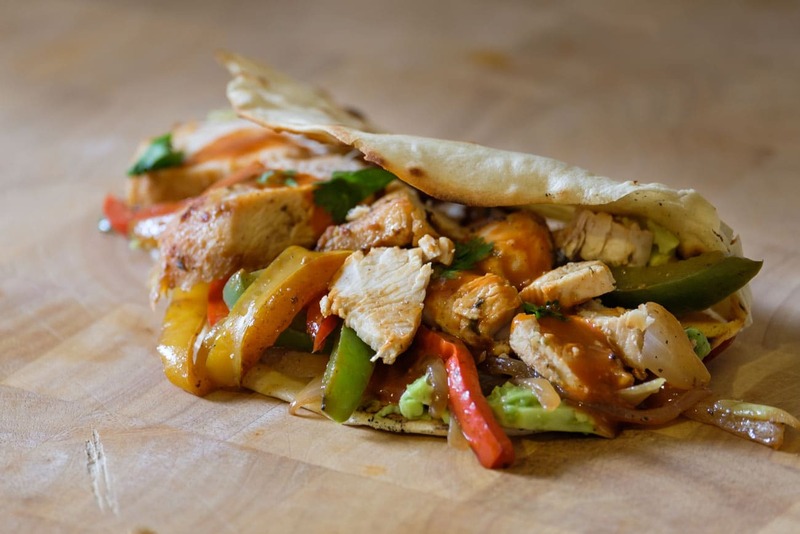 DID YOU MAKE THIS RECIPE?Mention @EatupKitchen or tag #EatupKitchen! I’m Anthony from Philadelphia. I started Eat Up! Kitchen because I love food. 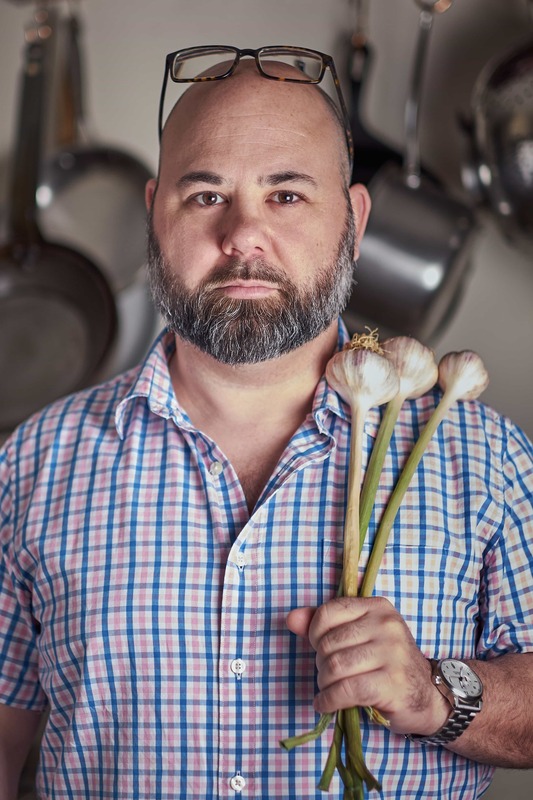 Not just that stuff you eat in the car or have GrubHubbed before you watch Game of Thrones, but the stuff that our history, culture, and tradition are built around. 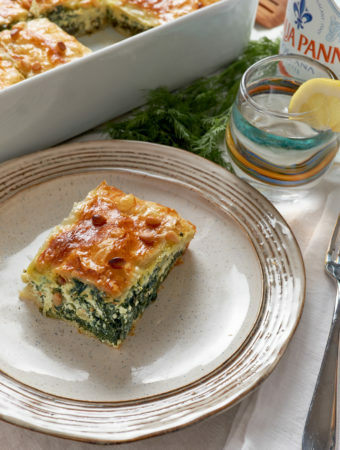 Browse the βeta Recipe Gallery.